Description: Learn how to draw the human figure quickly and with accuracy using a simple four-step approach to gesture drawing. Suggested Materials: 2B graphite pencil, kneaded eraser, and white drawing paper. There’s no formula for this measurement, but I would say in most circumstances, it is approximately 1/3 to 1/2 of “head” down from the shape of the head. So this would mean that is around 1 and 1/2 or 1 and 1/3 “heads” from the top line. my sketches are not looking proportionate like yours. Hang in there and keep practicing. The more that you practice this approach, the more natural it will feel to you and the more accurate your drawings will become. just curious: Figs 1-4, the indentation for the waist is considerably higher than where you put the waist line. Is this because (Fig 3 & 4) that is where you and this guy think his waist is; a gender proportion thing; or something else? I’m not sure if this is just my internet connection, but around the 36 minute mark (during the fourth gesture drawing) your voice from the beginning is speaking during the sections where you are quietly drawing the figure. It happens on and off through that segment. I enjoyed the challenge of this lesson. It looks like an error in the video. We’ll have to fix that. Thanks for letting me know! We got that weird gibberish out of the video now. Thanks for letting us know, Brandy! I realize that practice practice practice is the order of the day, however when I do the gesture drawing it looks SO out of proportion. I have even cut out figure 1 (yeah I made a paper doll) and had it right there beside what I was drawing and the drawing still looks alien. Torso way to long compared to legs. I am not giving up though. Another truly well written course! 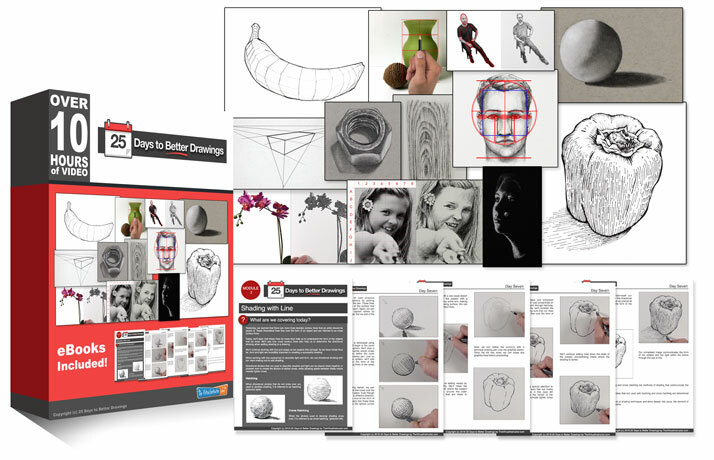 Like your Secrets To Drawing Course, this course organized all bits of information into one cohesive whole making it easier to improve my drawing skills. That being said,I am having a really difficult time with this figure drawing lesson. My proportions seem very out of wack. When you say shoulder line, it appears you are actually referring to the collar bone. But I can’t seem to figure out which part of the body you are referring to when you say waist. Do you mean the area just below the rib cage near the solar plexus or lower by the hip? Also, are men’s waist higher or lower than a females waist? I am not sure and I think it is because I am not understanding what I should be looking for. Thanks for your question. Perhaps you are overthinking things a little. Using this method, the shoulder and waist lines are really just observed points that help you begin drawing the figure. You really could pick any feature or location that you like. The general location of the shoulder and the waist however, can be recorded initially using a line – which of course is helpful. The line that I look for to describe the shoulder line extends straight from the top corner of each shoulder across the middle of the top of the chest. This line would indeed cross over the collar bone. The waist line that I record is typically located across the top of the pelvis. Describing this area as the “hips” would be accurate. As for men vs. women – every figure that you observe will have slightly different proportions. There is no body type that is specific for men compared to women. (Of course there are clear differences in the body shapes – women have wider hips, etc.) For example, some men have very long “legs” while some have very short ones. The same is true for women. Since every body type is different, it may actually be a hinderance to assume a specific set of rules (or a formula) for a man vs. a woman when it comes to proportion. We shouldn’t assume, for example, that all women have longer legs, arms, etc. because this isn’t true. Clearly, women have a different body shape than a man. But beyond this, there is isn’t a standard that applies to ALL women and ALL men. Thank you, Matt, for your quick reply to my question. I love gesture drawing, but am so very bad at it. I probably am over thinking it. In the studio, I can take my time and use various methods and tools to measure my subjects to (eventually) get a fairly accurate rendering of the subject. But out in the field where time is of the essence, well, I just have a very hard time of it and my proportions are never right. Do you have any suggestions or ideas (or perhaps a mindset) that I can do or think before I start sketching to help me loosen up or not over think this? I really would like to improve this facit of my drawing. I focused on drawing loosely and not stress out. Good Class.